Join the Mobility 21 Board of Directors and Advisory Board Members in honoring California’s transportation leaders at a reception in Sacramento. Contact Kristin Slocum to sponsor the event. James (Jim) McCluskie is a transportation professional with more than 30 years of engineering management and project oversight experience. As Moffatt & Nichol’s Vice President and Chief Strategy Officer, Jim is a key driver in expanding Moffatt & Nichol’s transportation capabilities to keep pace with client visioning in the 21st century marketplace. He also serves as Project Executive for the $1.9 billion I-405 Improvement Project and as vice president for the project’s design team, Pacific Infrastructure 405 Designers, a joint venture comprising Moffatt & Nichol, H.W. Lochner, Inc. and Arup North America Ltd.
As an active member of the Southern California business community, Jim is the current Vice-Chairman of Economic Development for the Long Beach Area Chamber of Commerce 2017-2018 Officers & Leadership Cabinet. Throughout his career, Jim has actively worked on major transportation projects through design-build, public-private partnerships (P3) and design-build-finance-operate procurement methods, bringing value through his strategic management skills in long-range planning and programming. 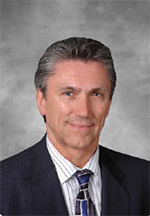 Prior to joining Moffatt & Nichol, Jim was a Senior Vice President with PBS&J, and, as President of AMEC Infrastructure, he managed offices throughout North America. Moffatt & Nichol’s transportation practice provides planning, design, economic, and strategic advisory services to transportation clients in North and South America, and to global supply chain clients worldwide. For the past four years, Avygail Sanchez has served on the Annual Mobility 21 Summit Planning Committee and supported Parsons executives who were Mobility 21 Advisory Board members. Now, Avygail herself has become an Advisory Board member, joining the Advisory Board at the end of 2017. From Parsons’ world headquarters located in Pasadena, Avygail’s Policy & Community Engagement work is focused throughout Southern California with a special emphasis on Los Angeles-based agencies such as the Los Angeles County Metropolitan Transportation Authority (Metro), Los Angeles County, the City of Los Angeles and Los Angeles World Airports, to name a few. Recently, Avygail convened Los Angeles County-based transportation agencies for the launch of the Small Business Partnership Program, creating a collaborative space to promote, connect, mentor and grow local small businesses. As a technology-driven engineering services firm, Parsons specializes in engineering, construction, technical, and professional services, and very often partners with small and disadvantaged businesses on infrastructure and construction projects for federal, regional, and local government agencies, as well as private industrial customers worldwide. Some of Parsons’ current Southern California projects include development of a modernized big data regional transportation information platform for the greater Los Angeles area and adjacent counties; improvements to the I-605/I-5 Freeways as well as the I-405; the West Valley Connector bus rapid transit corridor; the Purple Line subway extension; the Gerald Desmond Bridge; the Landside Access Modernization Program at Los Angeles International Airport, and numerous water projects. Avygail has more than 15 years of community and business development experience in Los Angeles. 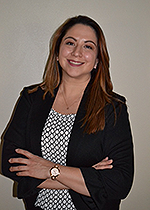 She holds a bachelor’s degree in psychology from Mount Saint Mary’s University in Los Angeles and a master’s degree in urban planning from the UCLA Luskin School of Public Affairs. While studying at UCLA, Avygail served as Field Deputy for a former Los Angeles City Councilmember, and worked on the transition team of another Los Angeles City Councilmember. 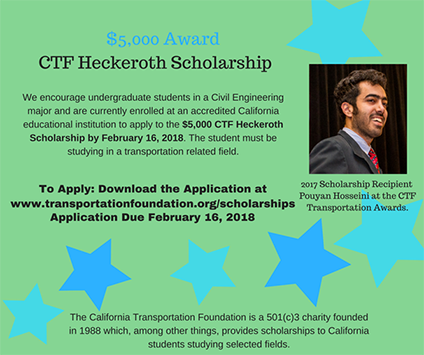 She is a Riordan Leadership Institute Fellow and a graduate of Leadership LA ’15, both of which are Southern California Leadership Network programs. 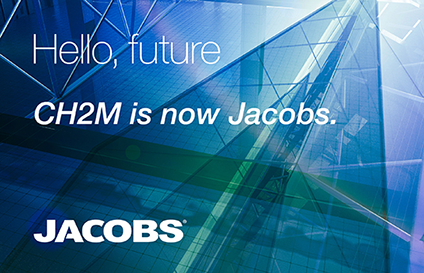 Jacobs has acquired CH2M, resulting in a new company unlike any other in our industry. As a leading solutions provider, Jacobs is now an even stronger partner, offering best-in-class technical and delivery capabilities to meet any need. Our top priority is uninterrupted service to our clients and their stakeholders. In areas that matter most to our clients’ success, Jacobs and CH2M are fully aligned. Our shared values include safety, integrity and ethics; a focus on quality and long-term client relationships; a commitment to sustainability; and serving clients with the best talent in the industry. In Southern California, the combination of Jacobs and CH2M means we are even more capable of taking on our clients’ most complex transportation challenges and solving them in ways not thought of before. Our people—the most talented professionals in the industry—are the secret to our success, and we have hundreds of projects across the southland that prove this. Our passion lies in helping our clients in every aspect of mobility—aviation, bridge, highway, port, transit, rail, tunnel, road, and active transportation projects—with expert planning, environmental, design, engineering, project and construction management services. We are also neighbors and community members, thriving on the larger purpose behind what we build—linking communities and advancing economic and social mobility. Together, Jacobs and CH2M have a longstanding and continued commitment to Mobility 21 and its member agencies, and the new Jacobs looks forward to continuing this partnership. For more information, contact Judy.Johnson@ch2m.com or Jared.Moore@jacobs.com. 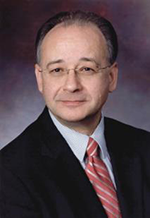 In a unanimous vote, the American Public Transportation Association’s (APTA) Board of Directors named Paul P. Skoutelas to serve as its new President and Chief Executive Officer effective January 8, 2018. Skoutelas has been a highly successful and respected national leader in the public transportation industry for more than 40 years. He served as CEO of public transit systems in Pittsburgh and Orlando, and most recently as Senior Vice President of WSP USA, one of the world’s largest architectural and engineering firms. View his bio here. 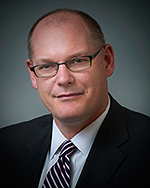 The appointment is the culmination of an extensive search process by a task force of APTA members chaired by Immediate Past Chair Doran J. Barnes, CEO of Foothill Transit. Ford also commended Richard A. White, APTA’s acting president and CEO, for his strong and steady leadership during the last 19 months. White will remain at APTA for a period of time to ensure a smooth transition. As the California High-Speed Rail Authority continues to move from the planning phase to full construction of the nation’s first high-speed rail system, the Board of Directors announced this month that it has selected a new Chief Executive Officer, Brian P. Kelly, to lead the organization, effective Feb. 1, 2018. Prior to his appointment to the Brown Administration, Kelly was at the center of major transportation policy decisions in the State for more than two decades, having served as chief transportation policy consultant for four successive Senate President pro Tempores. 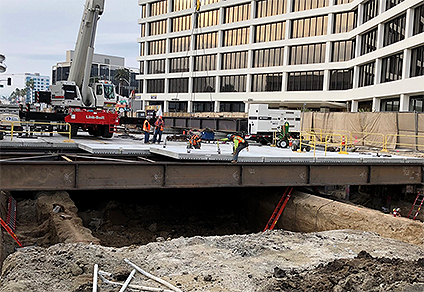 Crews perform street decking work at Wilshire/La Cienega on one of Metro’s key transit projects – the nine-mile extension of the Purple Line subway from the Wilshire/Western Station to Westwood. Construction on Metro’s Purple Line Extension is underway on the first section to Wilshire/La Cienega and will soon begin on the second section to downtown Beverly Hills and Century City. The plan is to have all three sections in operation before the LA 2028 Summer Olympics and Paralympics. Metro is working on the $1.3-billion grant necessary for section three (the federal money will be paired with money from Measures R and M). In total, more than 1,500 concrete panels now separate vehicular and pedestrian traffic from the excavation and construction on section one. Section two of the project will run from Wilshire/La Cienega to Century City with a station in downtown Beverly Hills near Wilshire and Rodeo Drive. On this section, the public can expect utility relocation from Southern California Edison, AT&T and LADWP and geotechnical boring work from Metro’s contractor Tutor Perini/O&G throughout January at the Wilshire/Rodeo and Century City/Constellation stations. Turn restrictions and lane reductions will be necessary to complete the work. On Section 3, advance utility relocation is expected to begin in February for the future Wilshire/Westwood station and will continue for two years. Local, state and federal officials gathered on Jan. 26 for the groundbreaking of the I-405 Improvement Project, the largest highway project under construction in California. Photo courtesy of OCTA. An innovative project aimed at speeding up commutes on the nation’s busiest stretch of highway started this month as officials gathered to break ground on the I-405 Improvement Project, which targets a 16-mile stretch of freeway between Costa Mesa and the Los Angeles County line. The $1.9 billion highway project, the largest under construction in California, is being led by the Orange County Transportation Authority, in partnership with Caltrans. The project adds one regular lane in each direction, between Euclid Street and I-605, as promised to voters through Measure M, Orange County’s half-cent sales tax for transportation improvements. The project also adds a second lane in each direction, which combined with the existing carpool lanes, will create the 405 Express Lanes. In addition to constructing the new lanes, the project will build, widen or replace more than 18 bridges, and improve freeway access and traffic on local streets. All this work is critical to accommodate expected growth in Orange County and throughout the region. Traffic on I-405 is anticipated to grow 30 percent by 2040. With the 405 Express Lanes, modeled after OCTA’s successful 91 Express Lanes, solo drivers will have the choice to pay a toll to speed up their commute. Carpools of two or more people can use the 405 Express Lanes for free for the first 3 ½ years after opening. Cars with three or more people can use the express lanes for free at all times. A significant project benefit is reducing the time drivers will be sitting in traffic. Projections show that without these improvements, by 2040 it would take more than two hours to travel this 16-mile stretch, but with the improvements travel times are estimated to be reduced to about 30 minutes in the regular lanes and about 15 minutes if a driver chooses to take the 405 Express Lanes. The I-405 Improvement Project, set to be completed in 2023, is being funded with a combination of local, state and federal funds, including a $629 million federal Transportation Infrastructure Finance and Innovation Act (TIFIA) loan. The federal loan will save taxpayers approximately $300 million compared to traditional financing methods. OC 405 Partners, a team of firms led by OHL USA, Inc. and Astaldi Construction Corporation, is designing and constructing the project, the largest in OCTA’s history. For more information on the I-405 Improvement Project, visit www.octa.net/405improvement. For a digital press kit, visit www.octa.net/405media. The Metrolink Mobile App now allows riders to seamlessly transfer to Metro Rail by using new technology to enter station gates without needing a physical ticket. 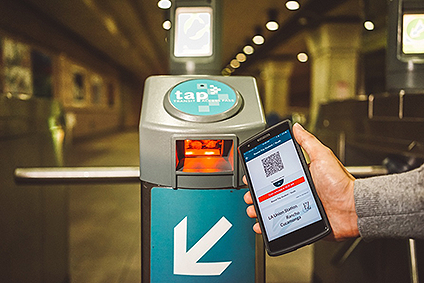 For the first time, Metrolink riders who purchase a mobile ticket through the Metrolink Mobile App can transfer to Metro Rail lines by simply scanning their phone at locked Metro Rail gates. Up until now, Metrolink riders transferring to the Metro subway or light rail lines had to find a ticket vending machine and wait in line to purchase a TAP-enabled paper ticket. Nearly a third of Metrolink riders transfer to Metro Rail on their way to jobs, school and other destinations. Many riders use a mobile app on their smart phones to ride Metrolink. Conductors scan their phones to check their tickets aboard trains. Using the Metrolink Mobile App is simple: users just scan the QR code they receive when they purchase tickets at station readers on gated entries. This upgrade to the Metrolink Mobile App cost $1.5 million and was financed by federal, state and local funding. This new project is part of a technology transformation Metrolink has made over the past six months, which includes the launch of a new website and GPS train tracker. Another upgrade to look forward to will make the mobile app available for Corporate Partner Program members. The timeline on this is being finalized. The City of Riverside’s Rose Parade float, which featured the Mission Inn Hotel & Spa’s Festival of Lights, won the Golden State Trophy for Most Outstanding Depiction of Life in California. Metrolink provided special round-trip service to Downtown L.A. from Riverside for people to view the Rose Parade, and well as special trains to Riverside to see the Festival of Lights at the Mission Inn Hotel & Spa. The Riverside County Transportation Commission and Metrolink helped brighten the holidays for thousands of passengers, thanks to special trains to the Mission Inn Hotel & Spa’s Festival of Lights and the Tournament of Roses Parade. A total of 11,274 passengers rode Metrolink to the 25th Annual Festival of Lights, a 128 percent jump over last year’s 4,950 riders. Special trains ran on Fridays and Saturdays on the 91/Perris Valley Line both from Los Angeles and Perris to Riverside, and on the Inland Empire Orange County Line. The special trains operated for four weekends between November 24 and December 16. 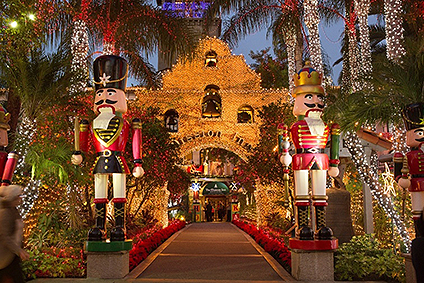 With more than 5 million twinkling lights, animated characters, Santa Claus, musical acts, horse-drawn carriages and holiday vendors, the Festival of Lights has become a “must-see” attraction for Southern California. The price was one hot ticket – roundtrip fares were just $7, and that included up to three children 18 years and younger with paid adult fares. The Riverside Transit Agency made travel even more convenient with free shuttles between the Riverside Downtown Station to the downtown festivities. Funding was provided by Metrolink, RCTC, RTA and a grant from the Mobile Source Air Pollution Reduction Review Committee. Travelers also kicked the new year off right by riding Metrolink from Riverside to view the 129th annual Tournament of Roses Parade. RCTC and Metrolink funded a special train from the Riverside Downtown Station to Los Angeles Union Station; from there, riders made a free connection to the LA Metro Gold Line for a traffic-free ride to Pasadena. The City of Riverside also was a great marketing partner and provided advance sale round-trip tickets for only $10, available at City Hall. A group of 272 riders made the trip to watch the parade and to cheer on the City of Riverside’s first float in 60 years. The float, which featured the Mission Inn and its Festival of Lights, won the Golden State Trophy for most outstanding depiction of life in California. Whether it’s for holiday celebrations or everyday travel, RCTC reminds travelers to connect with Metrolink. 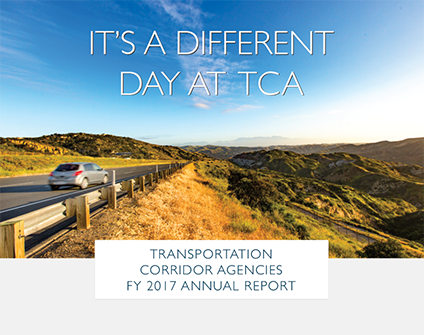 Learn more about TCA’s accomplishments by viewing the Fiscal Year 2017 Annual Report.